The following Special Sessions have been submitted. Authors interested in participating in these sessions are invited to submit their contribution to MeMeA 2015 via the EDAS site, specifying the session of interest. The Authors can upload their papers using special session option on EDAS. Depending on the number of contributions, Special Sessions will be organized within a track of both oral and poster sessions. Once the papers are accepted, the Special Session Organizer will interact with the Conference Organizers to put the session together. Please note that Authors of Special Session submissions will be notified of acceptance at the same as full paper authors, on February 15, 2015. Please contact the Special Sessions Chair, Simone Corbellini, for any questions and assistance concerning the Special Sessions. This special session deals with the all the aspects related to the measurement of mechanical and thermal quantities for the improvement of human health. Clinical measurements carried out in the hospital for patient diagnosis and therapy are considered as well as experimental measurements done in the laboratory with living tissues or cells. All biomedical fields that require the measurement of mechanical and thermal parameters will be considered here. Special attention is devoted to cutting-edge measurement techniques and analysis methods for applications across clinical medicine, biomechanics, biology and the life sciences. Contributions about novel measurement techniques applied to biotechnology are also welcomed. measurements and imaging with ultrasound. Hospitals, clinics, and smart homes face an exploding demand for wireless communications, when considering the extended usage of smartphones and the multitude of medical instrumentation, which is connected over wireless networks. This way, real time-monitoring, precise location and patient support are provided. Healthcare services become strongly related to the wireless communication capabilities, with the necessity of medical devices wireless connectivity and quality of service provision. 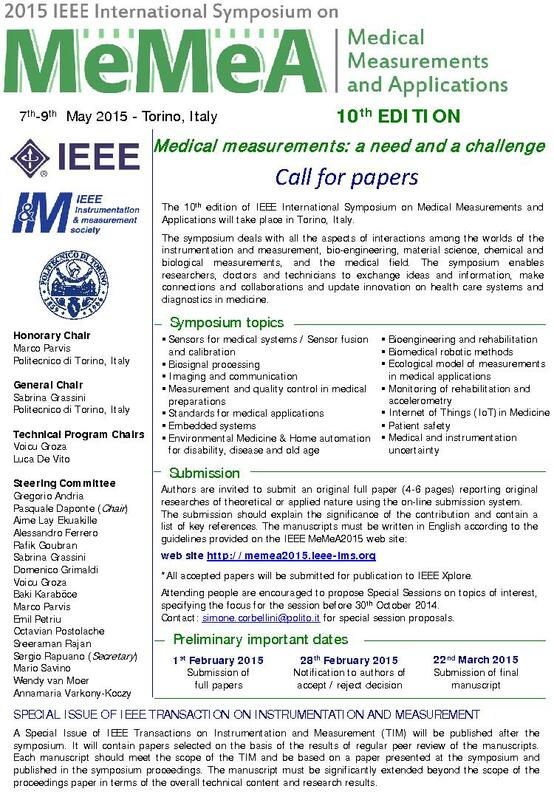 The essence of this special session lies in its interdisciplinary nature, joining contributors that work in the fields of wireless and mobile communications, as well as medical measurements. Neuromuscular disorder is a broad term that encompasses many different syndromes and diseases that either directly or indirectly impair the function of skeletal muscles and, therefore, impact on daily life activities. Also, in an aging society, neuromuscular disorders are among the principal causes of social costs and decrease of the subjective perception of health. The assessment of the neuromuscular system is based on non-invasive investigations on very different scales: from cerebral cortical function to muscle cellular metabolism. Therefore, advanced measurement and processing techniques from multiple data type are required. Clinically valuable and informative data about the neuromuscular system are provided by electrophysiology (EMG, EEG, ...), kinetics and kinematics, and imaging. Advanced data processing techniques, classification and interpretation strategies, development of innovative acquisition devices and sensors, wearable technology, and remote monitoring applications are needed for an accurate assessment of the neuromuscular system. Also, integration among different assessment techniques is becoming more and more important. This special session will focus on the latest developments in the fields of biomedical instrumentation, sensors and body-area networks, processing and classification architectures in the field of the diagnosis and evaluation of neuromuscular disorders. Applications to gait analysis, posturography, muscle fatigue and evaluation of muscle metabolism will be presented. Activity estimation based on wearable gadgets, smart phones and watches plays an important role in todays ICT based health applications and APPs. More serious applications are in research for rehabilitation and preventive medicine. These applications require a precise measurement of body motions in 3D. Miniaturized Inertial Measurement Units built as MicroElectroMechanicalSystems (MEMS), which are built for the consumer market are powerful measurement systems and may become an integral part of future health related systems. IMU’s come in wide variety which range from one axis acceleration sensor to units integrate up to 9 sensors (3*acceleration, 3*angular velocity, 3*magnetic field) into one MEMS unit and are combined with on board data fusion processor. Depending on signal processing and sensor fusion these systems are able to measure motion in 3D. But the measurement accuracy depend also signal processing, sensor data fusion and additionally on many factors like external disturbances. Users of these systems in research and application should know about the power and limitations of IMU based systems. The special session “Precise Motion Measurement using Inertial Measurement Units” will bring together people from industry who develop IMU sensors and from academia who work on signal processing and on applications for IMU’s with potential end users in different areas of medicine and rehabilitation. The utilization of fibrous materials is constantly increasing in biomedical applications. Characteristics of these materials are very important in terms of their applicability as implants. Important characteristics are: biocompatibility, porosity, fiber diameter, biodegradability or biostability (depending on the intended application) and non-toxicity. Their mechanical and electrical characteristics are also playing an important role. Furthermore, the mechanical and electrical characteristics of the attached tissue have to be taken into account for designing the interconnections between the implant and the tissue itself. Therefore, characterization of these materials and of the related tissue, especially employing mechanical and electrical measurements, are the main objectives of the session. HIFU are emerging and innovative technology that was used in medical therapy. Therapy by HIFU is a non-invasive, non-ionizing and safe treatment method for many kinds of cancer. There are numerous studies on this subject in order to characterize the systems/transducers and establishment of dose concept for ensuring the safe and efficient use. This special session deals with the all aspects related to primary and high-order reference measurement methods and to the Measurement Standards and Certified Reference Materials employed in biosciences analysis. As biosciences are intended biology, biochemistry, biophysics, bioengineering and bioinformatics. Special attention is devoted to traceability in Laboratory Medicine and in testing & control in Biomedical Industry. Contributions about novel measurement techniques and assays with a potential to become primary reference methods for the measurements of identification and of purity of biological entities are very welcomed. Novel measurement methods for traceable counting of biological entities are as well very welcomed.